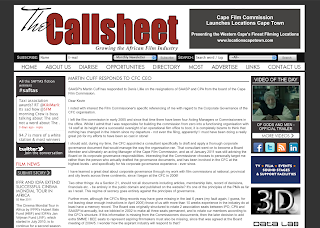 SAASP's Martin Cuff has responded to Denis Lillie on the resignations of SAASP and CPA from the board of the Cape Film Commission. I noted with interest the Film Commissioner's specific referencing of me with regard to the Corporate Governance of the CFC organisation. I left the film commission in early 2005 and since that time there have been four Acting Managers or Commissioners in the office. Whilst I admit that I was responsible for building the commission from zero into a functioning organisation with 14 staff at its height and a successful oversight of an operational film office to boot, it is completely bizarre to think that nothing has changed in the interim since my departure - not even the filing, apparently! I must have been doing a really great job for my efforts to have been so cast in stone! I should add, during my time, the CFC appointed a consultant specifically to draft and apply a thorough corporate governance document that would manage the way the organisation ran. That consultant went on to become a Board Member and ultimately an acting Manager of the Cape Film Commission, and as of January 2011 was still advising the Board on its corporate governance responsibilities. Interesting that the Commissioner chooses to personally target me rather than the person who actually drafted the governance documents, and has been involved in the CFC at the highest levels - and specifically for his corporate governance experience - ever since. I have learned a great deal about corporate governance through my work with film commissions at national, provincial and city levels across three continents, since I began at the CFC in 2006! Two other things: As a Section 21, should not all documents including articles, membership lists, record of decisions, financials etc. - be entirely in the public domain and published on the website? It's one of the principles of the PMA as far as I recall. This regime of secrecy goes entirely against the principles of governance. Further more, although the CFC's filing records may have gone missing in the last 6 years (my fault again, I guess, for not leaving clear enough instructions in April 2005) those of us with more than 10 weeks experience in the industry do at least have a memory record. The Board was originally structured to rotate 2 association seats between IPO, CPA and SAASP bi-annually, but we lobbied in 2002 to make all three seats permanent, and to rotate our members according to the CFC's structure. If this information is missing from the Commissioners docuuments, then the later decision to add extra SMME / BEE seats to represent aspiring filmmakers must also be missing, since that was agreed at the Board meeting of 2004/5. I wonder how the aspirant industry will respond to that?